If you know a bit about Apple or if you’ve read some of the recent Steve Jobs biographies, you probably thought that it’s a well known fact that the iPhone uses Corning Glass for its tough screen. Surprisingly, Apple never confirmed this officially, and even omitted the New York-based company from its 2011 list of suppliers. Now, though, Cupertino has finally verified that it’s indeed using the company’s rugged glass technology in a statement about the over half a million jobs Apple has created. "Corning employees in Kentucky and New York who create the majority of the glass for iPhone," Apple credits the company in its Job Creation report. So there you have it - no surprises in the glass used in the iPhone and one more confirmation of Apple's commitment to creating US jobs. actually, corning have moved the production to china next to the foxconn factories that make the iphone so, it is not shipped there and then back. no, its not even the same. you can see it is different with the viewing angles and the back of it is way different. Interesting; of course, they don't take advantage of Gorilla glass by actually having a FRACKING BEZEL around it. A bezel would decrease the amount of broken iPhone claims by a huge percentage I'm sure. bezel or no bezel, it won't make a difference.. it was not specified that iPhone uses gorilla glass.. it just uses a product by corning, which manufactures a lot of glass type, and not just gorilla.. it's like saying if i use an apple product, it doesn't mean that i use iPhone, i could be using the first generation iPod Nano maybe.. Does this mean the iPhone, too, can be put in the MiCrowAve? yeah, corning is glass manufacturer that has different products, one of them is gorilla glass.. i'm not sure that iPhone uses gorilla glass.. unless, of course, there is a confirmation that it really uses it, and not just a product from corning..
so according to apple, apple is single handedly responsible for keeping corning employees employed. their report is such BS its not funny. Using that logic, just by eating breakfast I am responcible for probably thousands of jobs between the farmers,factories, distribution, grocery store, the car i bought to get there, the gas i bought, the farm equipment suppliers, the mechanics that keep the machines at the factories rollin, the truck drivers, on and on and on. Sorry apple, you only get to count your direct employees, and your chinese slaves as direct beneficiaries since that factory is run under indirect apple supervision. Let's not forget about the other fishes Apple is feeding: lawyers, judges, ITC and USPTO. "so according to apple, apple is single handedly responsible for keeping corning employees employed. their report is such BS its not funny. " It never said that in the article. In fact, right from Apple's website, "As a result, we’ve created or SUPPORTED more than 500,000 jobs for U.S. workers: from the engineer who helped invent the iPad to the delivery person who brings it to your door." thats the same logic and math that Obama uses to try to say the stimulus worked, when it was a huge failure "created or saved". Its a total immeasurable LIE. And if every company used that logic, companys would be showing millions of workers each. My god, what could Exxon show as "created or supported"? BILLIONS since everyone runs on gas/energy/plastics/polys/all sorts of alloys/medicines/ect that are oil derived. Its a stupid argument meant to pull eyes away from foxconn and give them some false positive press at a time when they are dangerously close to losing that huge media support they have always had. Once in a great while I agree with you gallitoking. That's ultimately what I was getting at. Apparently, suppliers aren't apart of Apple until they do something seen as bad or wrong. Then you didnt read my whole comment. Apple gets flack for Foxconn because Foxconn has said directly that their large suppliers like Apple and MS dictate the working conditions and salaries at their plants. Apple is also well known to be extraordinarily controlling of its supply partners that deal with the sensitive parts of their chain, like Foxconn. I read somewhere.. on here I think.. that foxconn operates at like a 2% profit margin at those plants, while apple's profit per iphone is around 70%. If foxcon wants to raise the salaries of their employees more than a few cents, then they will have to renegotiate with Apple to get more money. If apple doesnt go for it, then the slaves get no raise. That is NOT the same thing as trying to take credit for "supporting" FedEx and Corning Jobs. no, they are slaves. They work at foxconn because its the only place out there in what is mostly rural farming communities. They go there trying to find a better life and instead are forced into what is basically indentured servitude, lest they get permanently blacklisted as a "trouble maker" and are never able to get another job... or if they speak up they get thrown in jail for an undetermined amount of time, like those poor slaves at the MS Xbox factory that tried to get attention by threatening mass suicide... just so they could get the workers better working conditions. They were immediately fired and jailed after being lied to. forced indentured servitude is slavery. Keep turning your blind eye and encouraging apple-foxconn to continue the madness. I will fight and annoy you every step of the way. one of the best coments Ive read in this site. They may be using Corning's glass, but it's not Gorllia Glass, the iPhone 4 is proof of that. I agree with TKFox007. As a verizon rep i see countless people come in with iPhones with no screen protector and its scratched to hell from change or keys where as my DROID with no screen protector might have one or two from dropping it, not from my keys. There is a difference!!!! Thanks Apple for using the highest quality to build your phones. 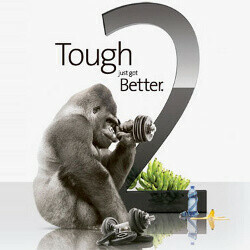 Apple was responsible for Corning coming into the cell phone game and thanks to Apple we have gorilla glass. Apple is THE model of an innovative and successful US company. Americans should be proud. apple is succesful, no doubt. but innovative? i havent seen any of that lately. well maybe in the courtroom. recycling old phone and tablet designs doesnt seem innovative to me.